"Cherries are marinated in bourbon whiskey to make them extra special. These are perfect as garnishes in drinks or even as a quick pick-me-up. Don't eat cherries and drive!" 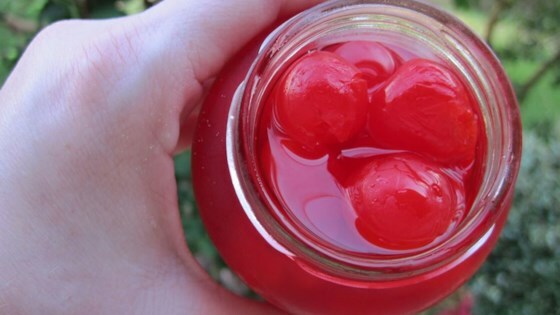 Drain the liquid from the jar of cherries. Replace it with bourbon. Close the lid and refrigerate for about 1 week for maximum flavor. After that, the cherries start to taste less like cherries. Delicious! ...but even better if you replace the bourbon with a good quality moonshine. These are addicting superbly delicious. Thanks to this recipe, I cannot stop making these. YUM! !